Are your sentences the right length? Do you have enough sentence length variation in what you write? The biggest problem? Most people don’t use nearly enough very short sentences. The first is Daniel Gilbert, author of the bestselling Stumbling on Happiness. Here’s a brief excerpt. The second is Michael T. Bosworth, author of Solution Selling. Daniel Gilbert scores an average of 4.47 characters per word and an average of 20.17 words per sentence. Michael Bosworth lands an average of 4.76 characters per word and an average of 24 words per sentence. I find Daniel Gilbert’s text to be infinitely more readable. It helps, of course, that he’s telling the story of a real person. This is so much easier to visualize than Bosworth’s more abstract scenario. But it’s also relevant that Gilbert uses shorter words and, even more importantly, shorter sentences. But most of us who write non-fiction are working to persuade busy, distracted people to read our work. The harder we make it for them, the less likely they are to want to try. This is why short words and short sentences are so important. The aspect of the Gilbert text I like the best is the second sentence. It’s only six words. Six words! This not only serves to reduce his average (allowing him to get away with a few much longer sentences), it also gives his writing a compelling, seductive rhythm. Smart writers aim for sentences somewhere between 14 and 20 words on average. Unfortunately, the best readability statistics calculator I’ve ever found (and it’s free!) gives only the overall average sentence-length for a piece. But it’s urgent to understand that – within this average – you need to show sentences at a wide variety of lengths. Otherwise, your writing will be boring. And it won’t have any rhythm! Gilbert: 13, 6, 14, 40, 24, 24. 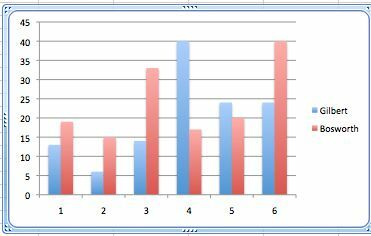 Then I plotted them on a bar graph. Take a look at it at the top of this post. My conclusion? Aim for a bar graph showing dramatic variation. And know that the more really short bars you have, the more really long ones you’ll be allowed. Consider it your shot at becoming Dostoyevsky.